Luna Energy Adventures – Come play in the wilderness and transform your life! Achieve greater happiness, access intuitive creativity, improve relationships, and more… while hiking, biking, skiing and exploring the Earth. 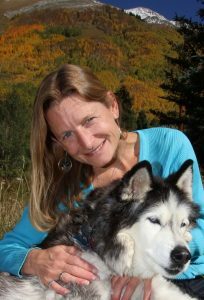 Kim Wheels with Siberian husky Luna at home – Ophir, Colorado. Luna Energy Adventures creates deeply enriching outdoor experiences as a medium for facilitating personal transformations. We help people deepen their connection to themselves and their bodies, by connecting with the Earth’s energy through playful and energizing explorative adventures. Access Consciousness BARS and body processes are deeply relaxing, nourishing energy healing tools that facilitate dynamic change in all areas of life. These are incorporated into the process to allow for deeper personal exploration and Earth connection. Custom package services are designed specifically for individuals or groups, from 1.5 hrs to multi-day adventures, and include additional phone consultation and tools shared online. Hiking, biking, skiing and more are on the menu and catered to the level-of-adventure you desire. Collaboration – Luna Energy Adventures is available to enhance wilderness experiences in partnership with outdoor guiding businesses, retreats, environmental projects, or other ventures focused on enhancing environmental preservation or consciousness. *Luna Energy Adventures operates wilderness experiences under Mountain Trip & other local guiding companies with permits and insurance to guide in the Uncompahgre & Gunnison National Forests.